This case-based clinical text is an exhaustive review of orthodontic problems in the vertical dimension, with evidence-based guidelines for successful diagnosis and treatment. A total of 21 cases address dental deep bites, skeletal deep bites, dental open bites, skeletal open bites, and posterior open bites. Each case includes pretreatment, interim, and posttreatment orthodontic records, as well as references to provide a solid evidence base for decision making. 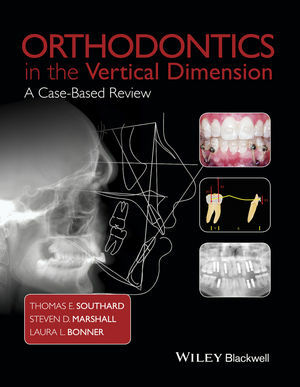 Written with a clinical focus, Orthodontics in the Vertical Dimension is ideal for the practicing orthodontist and makes an excellent resource for residents in pursuit of board certification. • 2500 clinical photographs and illustrations. Thomas E. Southard, DDS, MS, is Professor and Chair, Department of Orthodontics, College of Dentistry, The University of Iowa, USA. He is Diplomate of the American Board of Orthodontics. Steven D. Marshall, DDS, MS, is Visiting Professor, Department of Orthodontics, College of Dentistry, The University of Iowa, USA. Laura L. Bonner, DDS, MS, is Visiting Assistant Professor, Department of Orthodontics, College of Dentistry, The University of Iowa, USA. She is Diplomate of the American Board of Orthodontics. "The profession of orthodontics is largely a discipline of observation, reasoning, and decision-making. This book aims at strengthening those in-treatment decision abilities. It is perfect both for orthodontic residents just learning their technique and for experienced clinicians interested in improving their proficiency. I promise it will be one of the most remarkable books you have ever read."